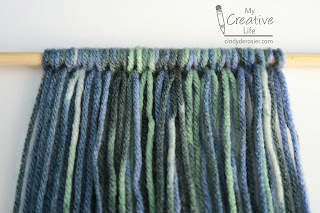 Cut the yarn into lengths approximately 2 feet long. You'll need a lot of them, but I recommend cutting them in batches of about 20. 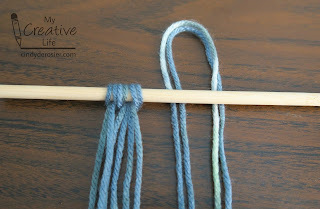 Tie the yarn onto the dowel. 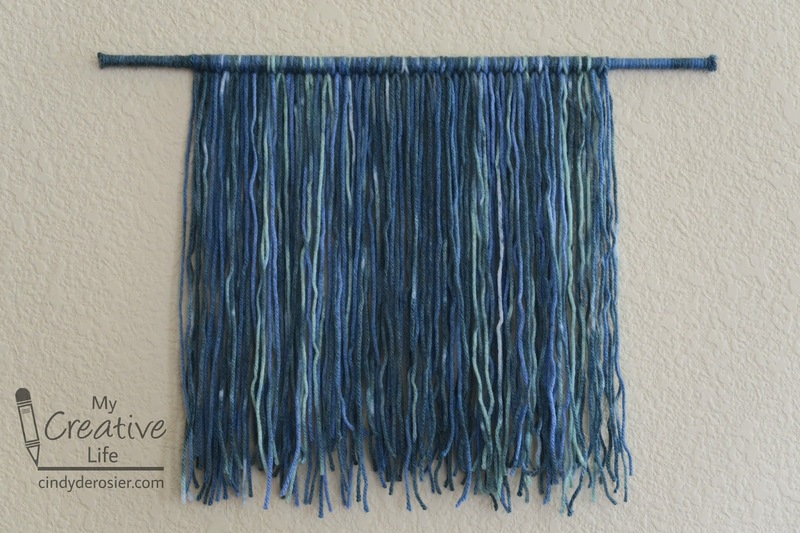 You can do the strands individually, but I sped things up by doing two at a time. 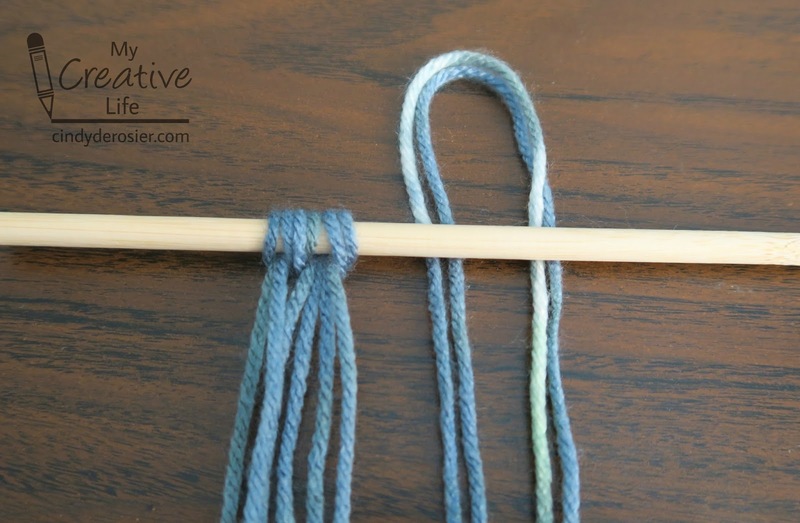 Either way, fold the yarn in half and set it behind the dowel with the loop at the top. 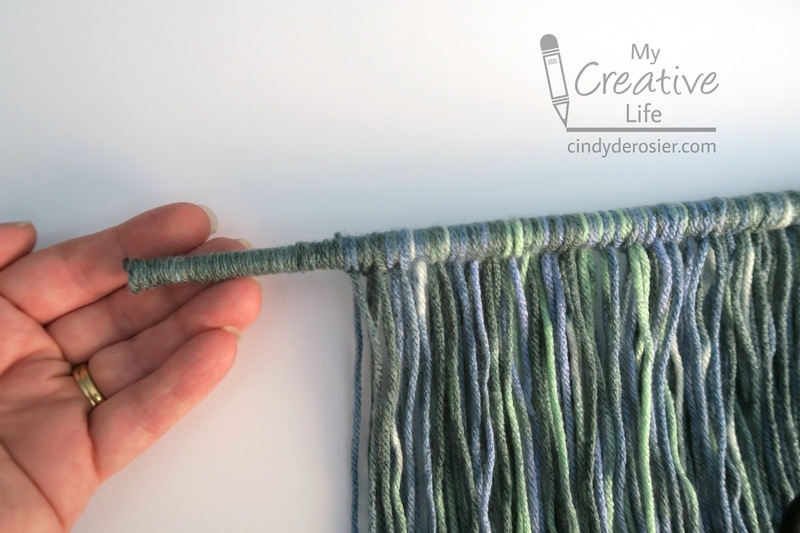 Gather the ends and put them through the loop, then pull to tighten. 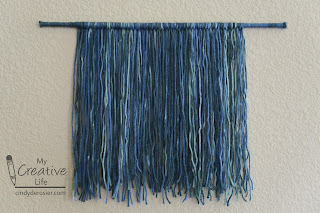 Keep adding strands until the dowel is about 2/3 full. 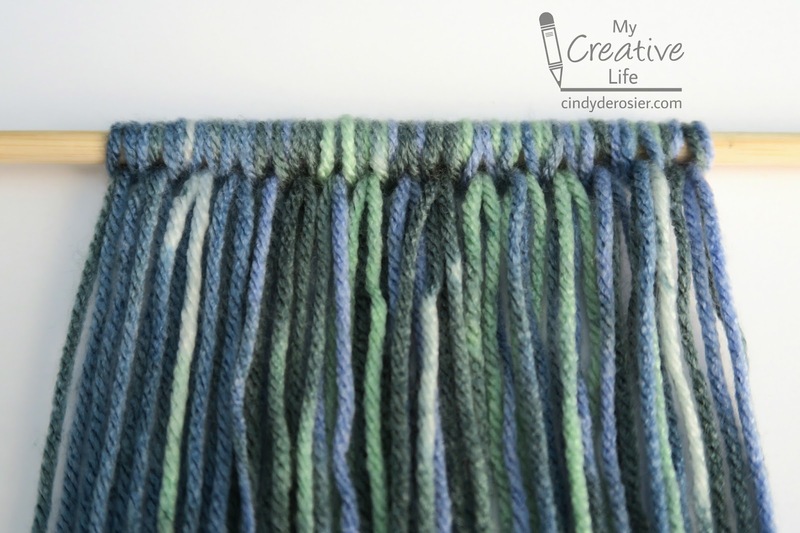 If there is a section that is heavy with one shade, simply slide the yarn over to make space to add more of a different shade. 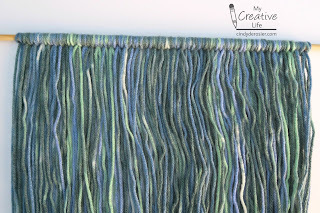 In this case, I ended up with too many blues in one area and wanted to add more greens amongst them. Much better. The colors are more even and balanced. 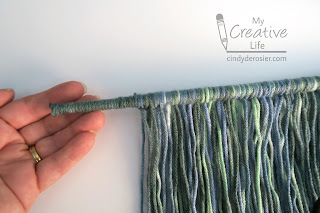 Add glue to the exposed ends of the dowel and wrap single strands of yarn around them to make a finished look. 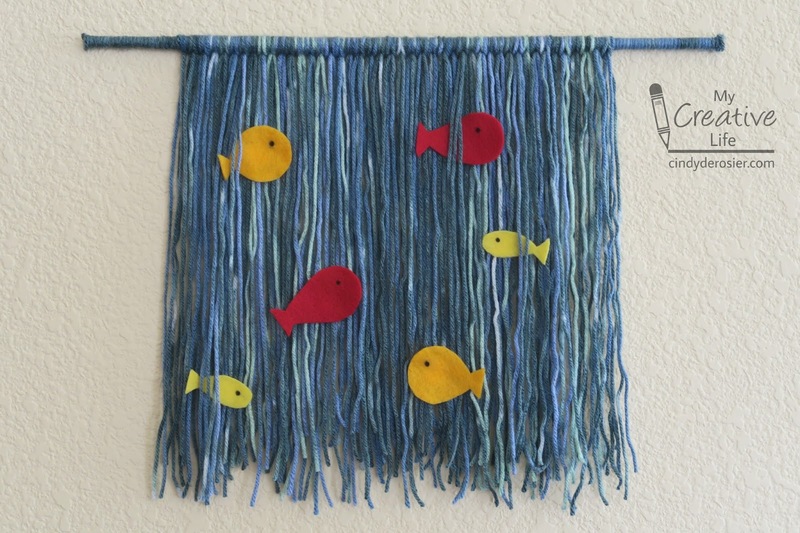 Tie fishing line to each end and hang your aquarium. 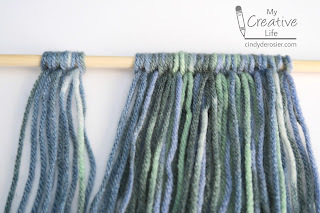 You can trim the ends to make them even if you want. I chose to leave them irregular. Cut simple felt fish shapes in a variety of colors. Add a black dot for an eye, then attach an adhesive tab to the back. 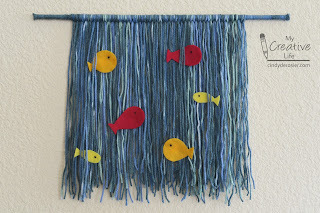 Now add the fish to the aquarium! 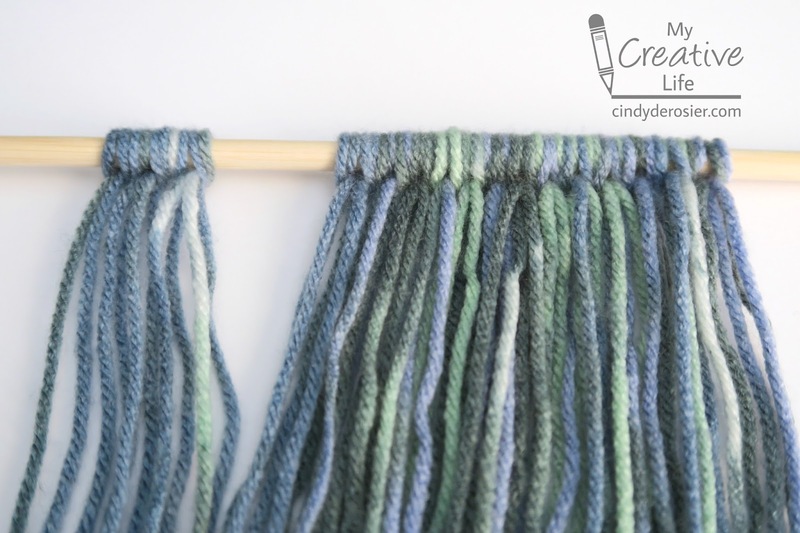 The tabs hold well for about 20 uses before they start to lose their stickiness. Just add another tab when that happens. 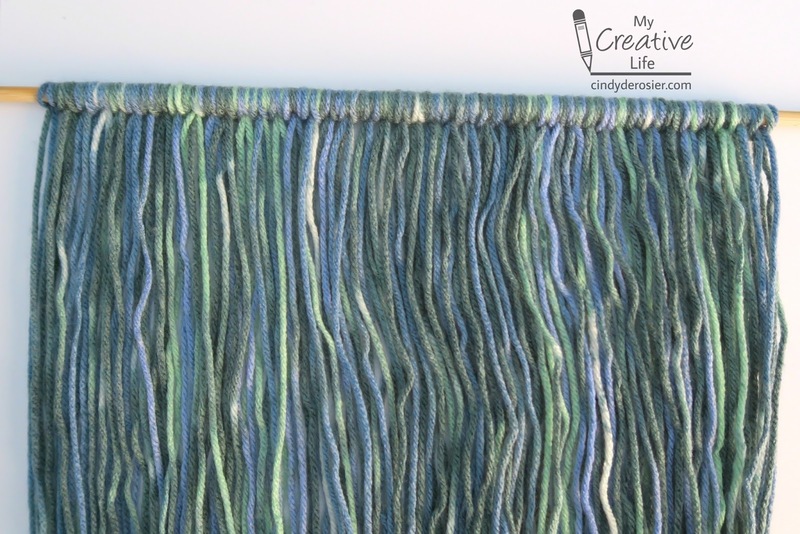 The tabs don't damage this high-quality yarn at all. Speaking of yarn, I want to thank the fine folks at Premier Yarns for giving me this pretty yarn. I still have a lot left, so expect to see this shade again because I love it! 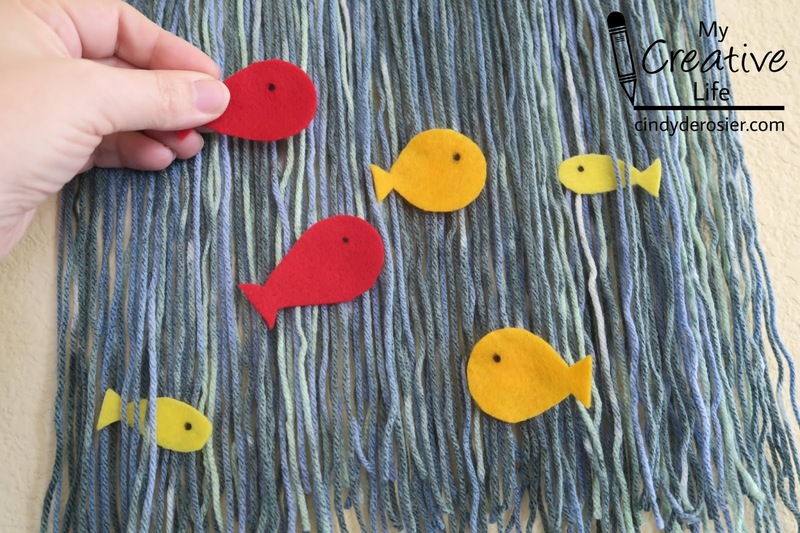 Also, don't forget that I have a coupon code for you to save on Premier Yarns through October 31! For those who prefer to buy in-store, their gorgeous Sweet Roll Yarns will be at JoAnn Fabric starting next week. It's already in-store at AC Moore, for those of you on the East Coast. 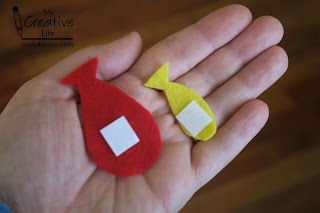 Such a clever and totally fun project! This is soooooooo clever! I loveeeeeeeeee it!!!!!!! !